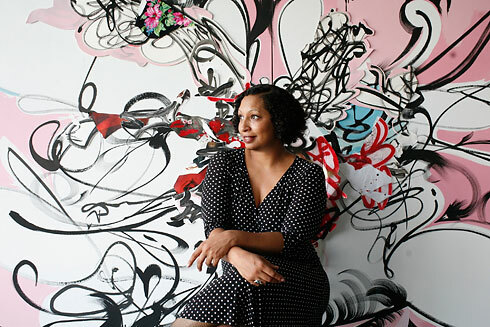 I would like to introduce to you some of my favorite women artists. Molly, over at Her Speak, posted about some of her favorites. Without further introduction, here are some to get you thinking, exploring and looking. I just discovered her artwork this year. 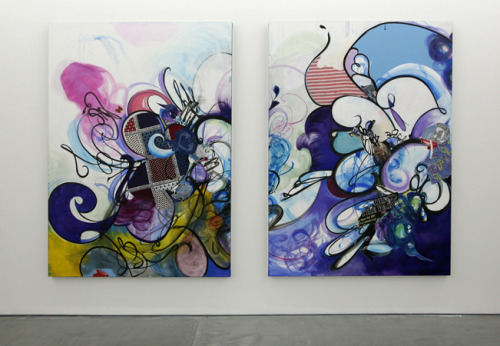 She had a solo exhibit at the contemporary art museum here in Madison. Her work is totally up my alley. I had the opportunity to hear her speak at an art convention and get her autograph and a photo taken with her. 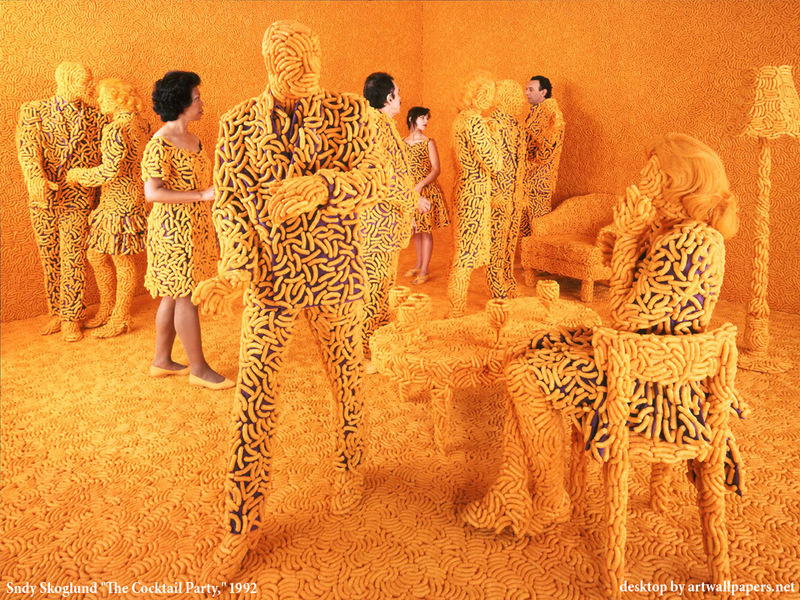 This is so amazing, because it is not an artwork created by a computer, it is an actual scene made of cheese puffs! Here is a an OLD lesson that I taught about 6 years ago at my previous school. I think these turned out lovely. 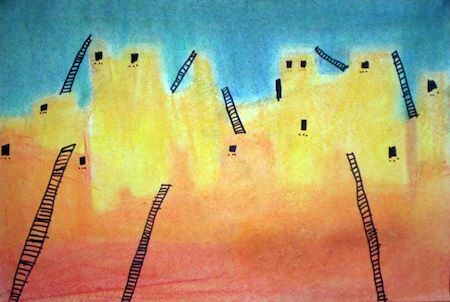 These chalk drawings were inspired by the Pueblo dwellings of the Native Americans. We read about the lives and homes of these people and then drew a picture of some homes inspired by the style of their dwellings. 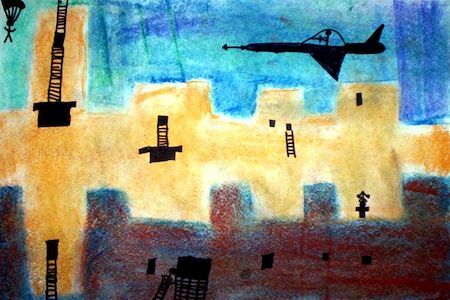 We used a chalk stencil method to make the background... similar to this technique, but we cut out the shape of the buildings. I encourage you to share YOUR LINKS to old lesson plans that you may have taught awhile back! 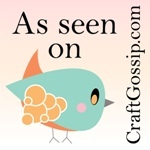 Seth Apter is hosting a Buried Treasure blog hop. Each participant reposts a really cool blog entry that they had posted a while back, that may have been buried after some time, a hidden gem of sorts. This is my entry, which I had posted a while back at my other blog. You can see all of the other hidden gems at his blog. I was into some insane doodling here.... lots of watercolor paint, markers, sharpies, white paint markers, magazine cut outs and more. I later ended up cutting this picture into pieces to use in other ways. Speaking of doodles, this book, Oodles of Doodles, is a very fun book for kids. 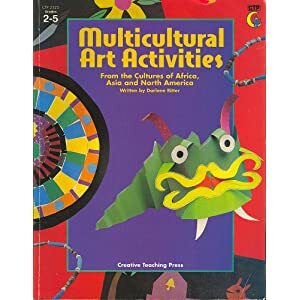 I have this in my elementary art classroom and sometimes kids will take it out in their free time. It is small, pocket-sized, but has a lot of pages. I also enjoy this book, The Doodle Formula, which is fun for scrapbookers. It is more like a booklet, but it has a lot of fun inspiration. If you are interested in looking at it, I found mine at Michael's craft store. It doesn't have a lot of pages, so you might want to flip through it before you shell out the money for it. I have looked at it over and over for fun ideas. Another book, which has not come out yet, but I am really looking forward to is Doodles Unleashed. I have Traci Bautista's other book, which I look through all the time. All you have to do is leave a comment here and I randomly pick from the people who commented. You have until next week Wednesday to leave a comment. I have so many art books, and many are duplicates of ones that I have at school. This week I am cleaning out my book case! Almost up to 200 followers! Blog land has been pretty quiet over the summer. I assume most of the teachers are off enjoying a relaxing summer. If I get 3 more followers, I will reach 200! 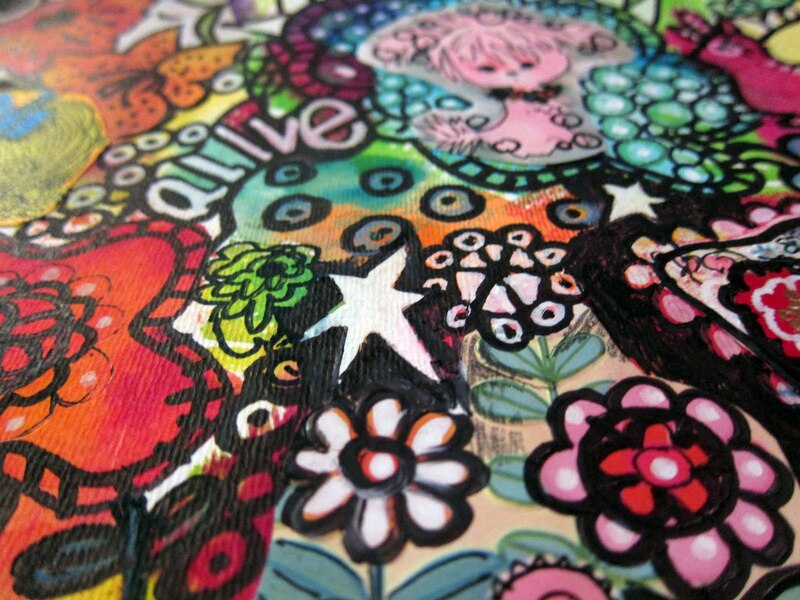 When I hit 200 followers, I am going to have a blog giveaway for a fun art book. Be on the lookout for a giveaway soon. Here is a mixed media collage I just finished. Summer is the perfect time to catch up on your own art making. 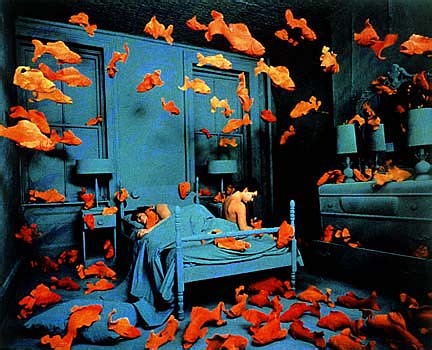 What kinds of art have you been making this summer? Here is one of my favorite little clay projects I have done. 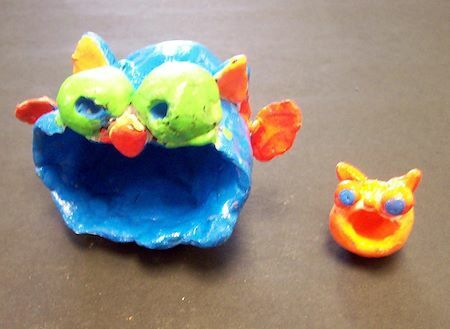 We made clay monsters. I taught this project about 5 years ago and I haven't done it again. I think I will do it again this year. These are really easy. You just make a pinch pot, turn it on its side and then add your features. We painted these with neon tempera paints. Acrylic paints would probably work better. We also spray varnished them. And now it's your turn!! Find an old blog post or create a new blog post about an old lesson you taught a while back and maybe want to revive or try again. Maybe the lesson didn't really work as you planned and you are going to make some tweaks on it. Maybe you posted about this project a couple years ago and you want it to see the light of day again. It can be as simple as looking at the very beginning of your blogging and linking up to that. Today I am going to share with you some pages inside the book Parade, by Donald Crews. This book would be excellent to illustrate the idea of showing depth through overlapping. The colors and pictures are so much fun! 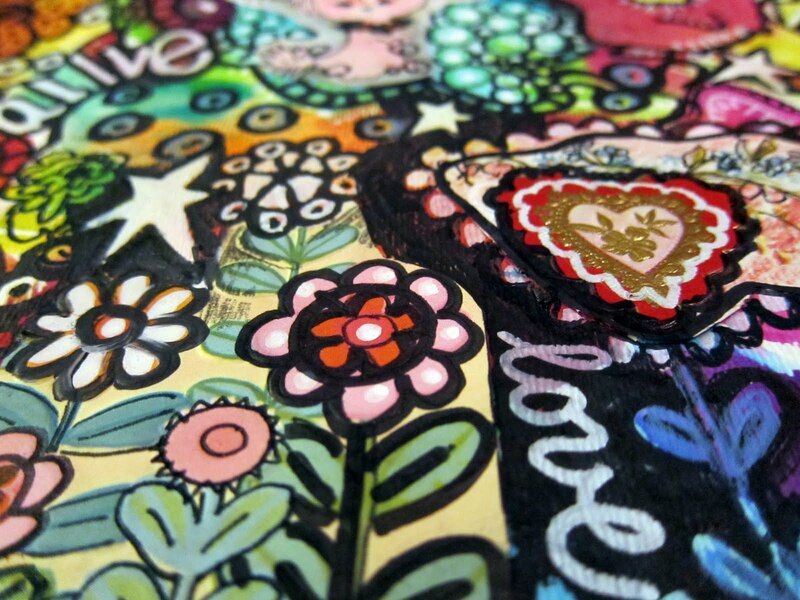 Today I am featuring Karen Bosch on the 5th installment of the Art Teacher Showcase. 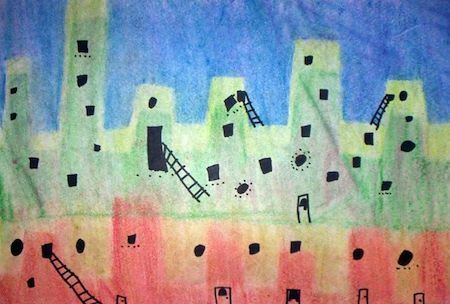 2) Last year was my FIRST year teaching elementary art at Southfield Christian School in Southfield, Michigan USA. However, I am not a new teacher - I spent many years teaching third grade and for about 10 years have been the technology teacher for K - 8. Because of budget issues, I spent the previous year teaching 5th grade and last year teaching art and technology. I started following many art blogs to help me learn about teaching art and to get inspiration for projects. My blog features both technology and art projects and many projects combine both areas! 3) One of my best projects from the year was creating papier maché penguin online story books! 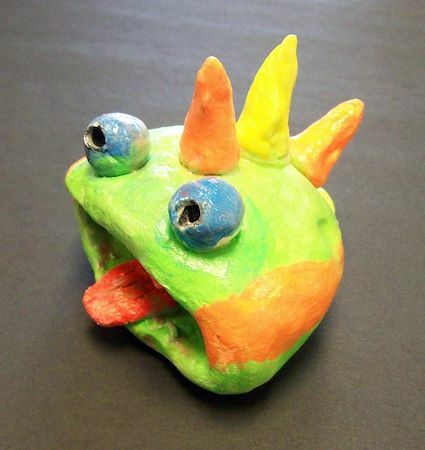 The project combined a papier maché art project with story writing and photography and audio recording using an iPod! The art project is blogged here (http://bit.ly/jLV0wq) and the iPod storybook is blogged here (http://bit.ly/lFMDS0). 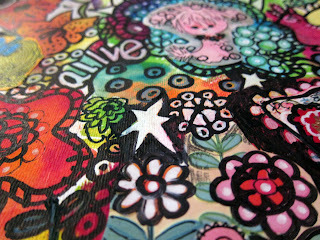 4) My favorite book to help inspire art ideas has been the Usborne Complete Book of Art Ideas (http://amzn.to/kL86k1). Over 400 cool ideas that can be adapted to all kinds of projects! 5) My favorite product in the art room is not anything unique. It is the black Sharpie marker! I have been using them in all kinds of projects. 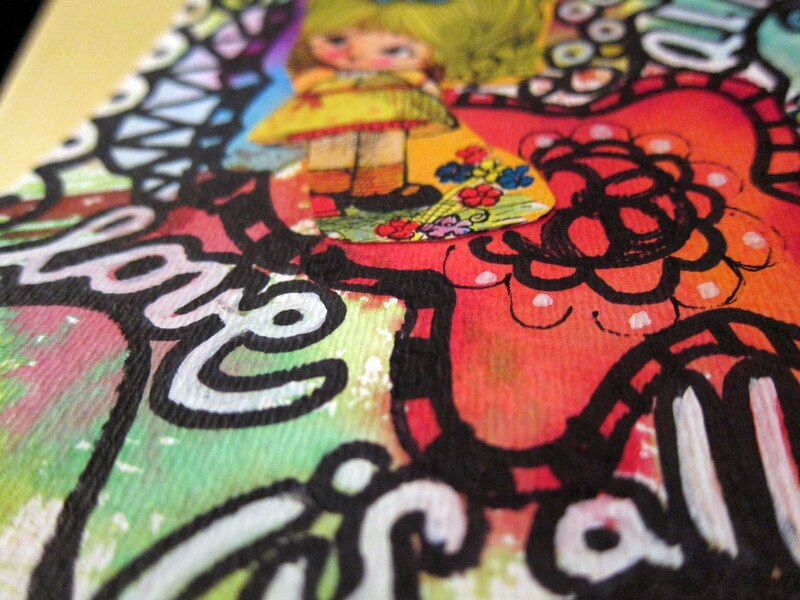 A Sharpie outline helps make any project POP! Water Color Time Lapse from Karen Bosch on Vimeo. If you want to be featured on my blog, then answer the following questions. Please email them to me at marciadotcom@yahoo.com. Don't comment on this post with your answers. If you do email me your answers, you will give me permission to post a couple images from your blog to include in the blog post (with of course, a link to your blog). If you only feel like answering a few questions, that is fine too. I would also be happy to feature your own personal artwork. 2. 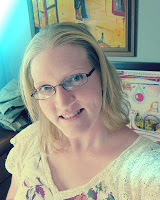 A brief description of your blog and why it is awesome. Tell us where you live and work, what you do, etc. 3. 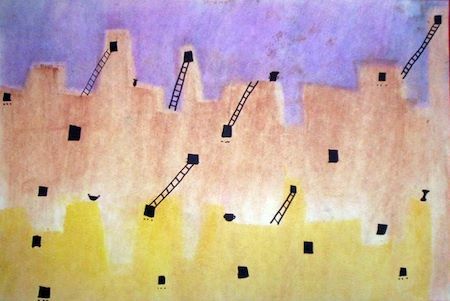 An example of a tried and true art lesson favorite that you have taught. (could be in a workshop setting, school setting, or just with your own children or yourself, no exclusions here!) Give me a link to a post about that lesson, so I can include a link and photo. 4. A favorite, must-have art teacher or art technique book. 5. Your favorite product for the art room. So, what are you waiting for? Email me today about your blog!!" I figured out how to make a stand-alone page for the art teacher directory! If you haven't added your's yet, you must! It needs to be an art teacher blog, however. I will delete it if it is something else. 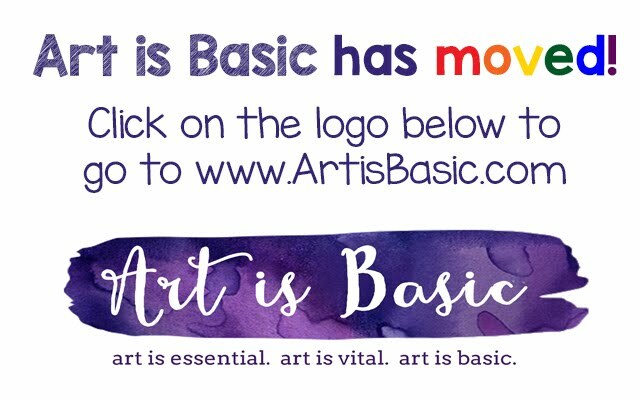 Find the art teacher blog directory here. I am taking a watercolor class this summer at the local recreation and parks department. Our first real painting assignment was to paint a picture of clouds. No, it couldn't be just a white cloud on white paper. This was a great assignment, because it is actually one that I do with my 5th and 6th grade students. Now I will know some new tips and techniques to share with them. You can see their beautiful pictures at this blog post. I'm pleased with how the clouds turned out, but I might go back in and define the tree/grass area. 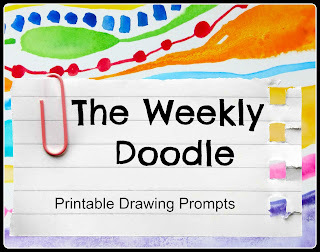 The next Art Teacher Blog I will be showcasing is Jody Sebring's. 2. A brief description of your blog and why it is awesome. Tell us where you live and work, what you do, etc. Not sure I am at "Awesome" yet but it's new, since April and so much fun. I teach in Clarkston Michigan for the Clarkston School District. I teach Pre K-5th grade art. 3. 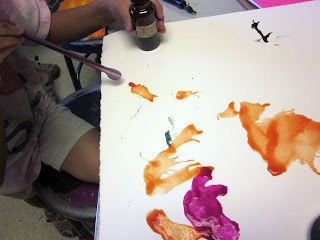 An example of a tried and true art lesson favorite that you have taught. (could be in a workshop setting, school setting, or just with your own children or yourself, no exclusions here!) Give me a link to a post about that lesson, so I can include a link and photo. One of my favorites, and I say favorite a lot is the clay owls. I usually do this project with fourth graders. I have the How to on my blog. 4. A favorite, must-have art teacher or art technique book. Any book on clay projects is a favorite. I have one in mind but I think it's packed in a box right now. It's by a Michigan art teacher and I think it's title is Clay Ideas. 5. Your favorite product for the art room. Just posted my favorite tool and it's my clay cutter! 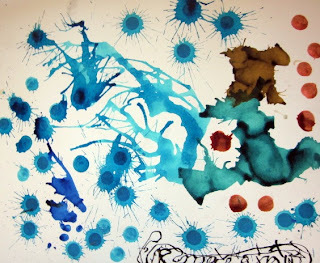 Another fun activity we did at art summer camp was blowing ink with straws. 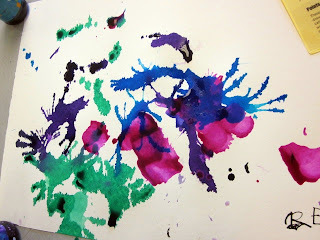 First, squirt out a bit of liquid watercolor (we did not dilute it at all). 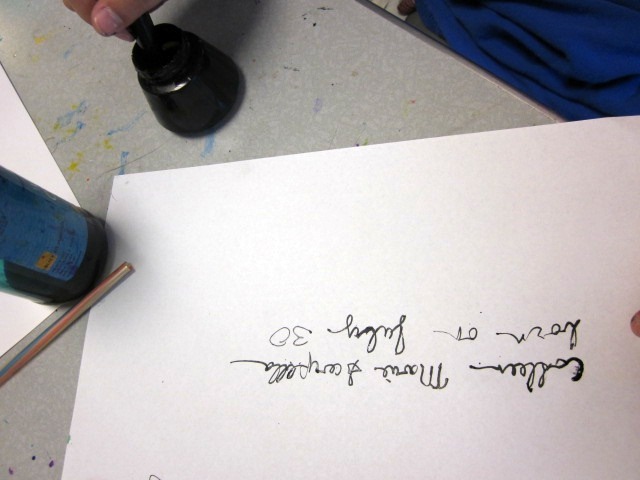 Then, take a straw and hold it right above the ink and BLOW! See what happens! You can embellish them with writing, drawing or more paint. We also used paint dabbers to add circles. Fun Fun Fun! Some of the kids also worked with calligraphy pens and inks during this time. Don't forget to send me YOUR favorite lesson plan for my ART TEACHER SHOWCASE! It will be better if we have a lot of teachers participating!! Daria's second preschool art class was all about gluing. She had a blast thickly applying the glue stick to plastic containers and putting little bits and bobs on it. She had fun sorting the pom-poms and coloring with oil pastels on the plastic. I didn't know oil pastels showed up on plastic!